This persuasive speech about self-consciousness was sent in by Laiba from Canada. Laiba's topic is something with which I think we all identify. This makes it an interesting topic choice and one that is likely to capture an audience's imagination, particularly a very young audience. Laiba starts by defining the term 'self-consciousness', explores its impact and proves just how harmful it can be. Finally, she suggests ways of overcoming it. It's a nicely written speech that flows well, with a positive, uplifting conclusion. I hope you find this sample speech inspiring, when it comes to putting together your own presentation. 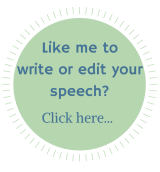 If you would like to share your speech with the visitors to best-speech-topics.com just fill in the form. Thanks so much Laiba for sharing your speech with us! It all starts with one feeling. A feeling we all know well, something you may feel every morning before school, or every time you go out. An undue awareness of yourself, your appearance, or your actions. This is the direct definition of self-consciousness... judging yourself for being you. Hello fellow students and teachers. My name is Laiba and today I will be proving to you that being highly self-conscious can cause a great deal of harm. Being self-conscious is, in itself, nothing bad nor harmful. But being TOO self-conscious is a different matter, leaving you feeling embarrassed and uncomfortable wherever you go. Being highly self-conscious can lead to many negative outcomes. Yet have you ever wondered what the phrase 'self-conscious' really means? Self-consciousness is a discriminating sense of self awareness. Judging yourself for who you are, how you look, or otherwise negatively comparing yourself with others. I know that almost everyone in this room has felt self-conscious at least once in their lives and we are certainly not as alone in this as we may think. Studies have proven that teenagers experience health issues - such as eating disorders and depression - because they are too self-conscious. This is because, as they grow older, their minds become more and more sensitive as they are exposed to unexpected challenges. However, it's not only teenagers who feel this way. Even kids our own age are getting sucked into this world full of negativity. Being too self-conscious can trigger negative emotions. Sadness, hopelessness and anger can cause you to focus on bad times in your life, such as receiving bad grades, or fighting with a friend. As you dwell more and more on negative things, you begin to feel so bad that you blame yourself and start feeling depressed. This is a very unhealthy pattern of thinking that can be difficult to overcome. It can feel like being stuck in a dark room that gets darker and darker by day, with no window, door or light to lead you out... only brick walls keeping you in. So is there a way to stop this, to let go of the negativity trying to invade your life and get this invasive poison out of your system? Think about Chinese handcuffs, the more you struggle the more they tighten as there's only one way of getting them off. In this case, what you have to do is the opposite of thinking self-consciously. Instead, start believing in yourself. Let go of all the negativity weighing you down and let your confidence spring forward. Break the brick walls and let the beautiful light pour in, filling up the room, filling up you. In conclusion, I strongly believe that being highly self-conscious is incredibly harmful. It can lead to depression and make you think negatively about life. So stand up to your bully because the only person who can help is YOU! The next time you look in the mirror, fight that bully and you'll see a confident face smiling back at you.